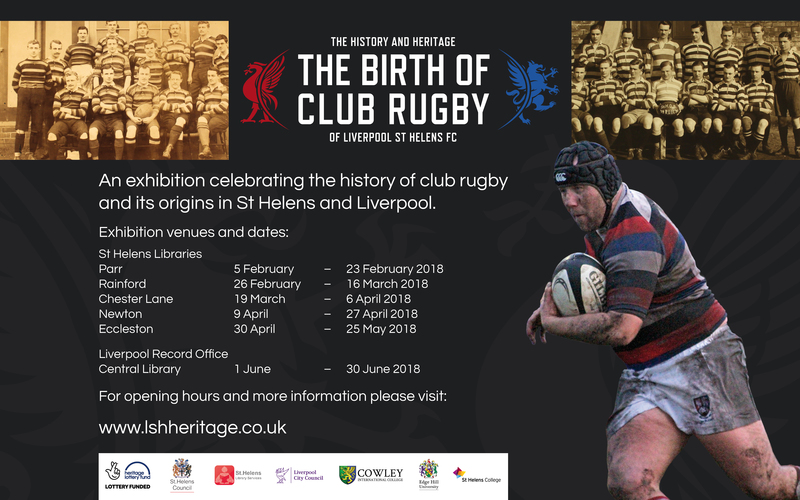 Liverpool St Helens Football Club are pleased to announce that their touring exhibition will begin at Parr Library, St Helens on Monday 5 February 2018. 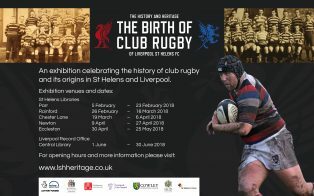 THE BIRTH OF CLUB RUGBY spans three centuries and is a tale of three clubs, Liverpool FC, St Helens RUFC and the current club Liverpool St Helens, following the merger in 1986. The exhibition features stories, photographs and illustrations namely in 1871 the first ever England International match including three Liverpool players; the impact of World War I on the team which went to war and the five players who never returned; the formation of St Helens Old Boys by former Cowlean pupils in 1919 and the subsequent generosity of Colonel Pilkington to the club; the successful years from the 1950s when Liverpool was one of the country’s leading clubs, through to the merger in 1986 and beyond. It also charts the development of the game of Rugby itself including the formation of the Northern Union and Rugby League in 1895, the growth of professionalism in the 15 man code and covers such issues as changing trends in kit throughout the ages. The club has fielded 57 Internationals from 1871 to the present day including Mike Slemen, the club’s most capped player; Kevin Simms; Nigel Heslop; Ray French; Fran Cotton; Martin Regan and Dewi Morris.